Our Pensacola, Florida Hotel is Your Home Away from Home. 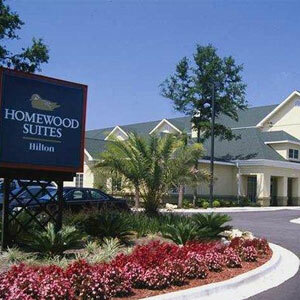 Welcome to the Homewood Suites by Hilton Pensacola Airport (Cordova Mall Area) hotel. If you are in Pensacola on an extended stay, for military training or a business trip, you’ll enjoy our friendly service, outdoor pool, and sports court. Only minutes from Downtown Pensacola and its thriving arts scene. Our 107-suite Pensacola, Florida hotel is located less than a mile from Pensacola Internatoinal Airport Complex and Cordova Mall’s shopping, restaurants, and cinemas. Naval Air Station Pensacola and businesses are easily accessible from the hotel. Relax on the sandy Gulf of Mexico beaches, fifteen miles from your home base in Pensacola. Enjoy a round of golf at Marcus Pointe Golf Club or practice your tennis stroke on the hotel’s sports court. Visit the museums, homes, and buildings of Historic Pensacola Village. Explore Pensacola’s dining options, from a casual burger or salad to sushi, seafood, or a sizzling steak. Use our complimentary shuttle service for local destinations. Relax over coffee or tea served throughout the day in our inviting lobby. Stay connected with high-speed internet access and WiFi throughout the hotel. Join us for our daily full hot breakfast and evening dinner with drinks*, served Monday through Thursday.Choose a spacious studio, one or two-bedroom suite with kitchens, king or queen-sized beds, additional sleeper sofas, and 32-inch flat-screen HD TVs and premium cable programming.